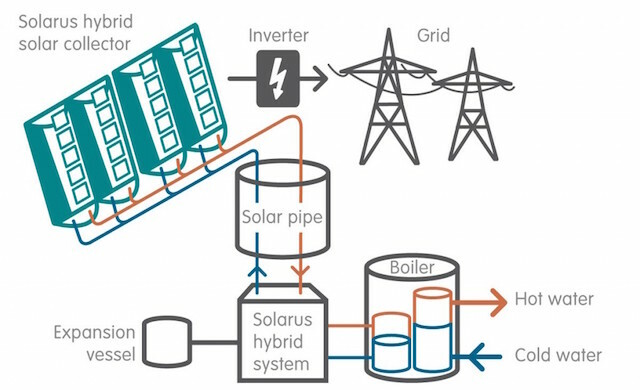 Combining two types of energy production into the same surface area allows these hybrid solar thermal panels to produce quadruple the amount of energy as a conventional solar photovoltaic (PV) system of the same size, according to Solarus. 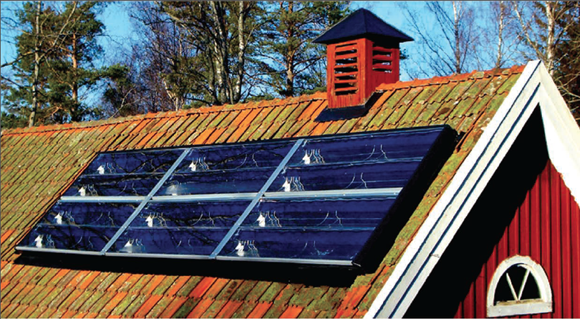 The Solarus hybrid system incorporates a solar PV component, which generates electricity from the sun, with a thermal collector that not only harvests heat, but also does double duty as a system for keeping the PV panels from overheating (which optimizes electrical production and helps to mitigate the negative effects of heat on the PV cells). The thermal energy can be used to heat domestic hot water, fed into a heat exchanger to heat the home, and in larger installations, could be used for tasks such as desalination, steam production, or converted into electricity. Although the Solarus hybrid solar thermal panels aren’t yet available to the public, according to the information on the website, once production of the system has been scaled up, the payback time for these modules could be as quick as 5 years or less (depending on local feed-in tariffs), and the models are expected to be lower in price than conventional PV panels of a similar size. Find out what solar power can do for you!